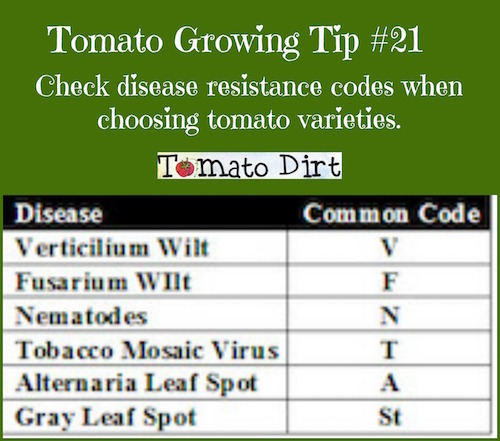 Tomato disease resistance codes are listed on tomato seed packets or on tomato seedling labels. They appear in capital letters. 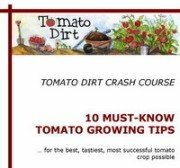 Here’s the dirt: many tomato varieties are bred specifically to resist particular diseases. This is helpful information if you want to grow healthy plants! You can choose tomato varieties that are resistant to diseases that are common in your growing region. When you see what looks like a confusing group of letters on plant or seed packets, never fear. You’re not buying classified information from a foreign country. Instead, you’re looking at disease resistance codes, which are special gardening lingo for “here are some really good characteristics of this plant.” Each capital letter stands for a particular disease or pest. Here’s how to decipher disease resistance codes. What do each of these codes really mean? “V” means the plant is resistant to the fungi that cause verticillium wilt, Verticillium albo-atrum and Verticillium dahliae. The fungi work their way up through the plant’s roots, clogging water-conducting tissue in the stem. They spreads a toxin that wilts leaves and prevents water from reaching branches and leaves, starving the plant. Yellow spots appear on lower leaves, followed by brown veins. Leaves then turn brown and fall off. Infection pattern often resembles a V-shape. "F," "FF," or “FFF” means the plant is resistant to Fusarium oxysporum fungi that cause fusarium wilt. First signs are yellowing and wilting on one side of the plant – a leaf, single shoot, branch, or several branches. Yellowing and wilting move up the plant as the fungus spreads, clogging water-conducting tissue in the stem and affectively starving the plant. Left unchecked, fusarium wilt can kill tomato plants well before harvest time. Unfortunately, some fusarium fungi have overcome the initial “F” resistance attributes in designated tomatoes. Today, newer cultivars have been bred to be resistant to secondary fusarium strains – hence the “FF” and “FFF” designations. "N" means the plant is resistant to nematodes, parasitic round worms that often lie dormant in the soil. Nematodes can produce root galls on the plant up to an inch wide. Affected plants are weak, stunted, do not respond to fertilizer, and tend to wilt. "A" means the plant is resistant to the Alternaria alternata fungus that causes Alternaria stem canker. Brown or black cankers attack tomato stems, leaves, and fruit, often accompanied by streaks. Left unchecked, cankers can spread across the entire plant and kill it before harvest. "T" means that the plant is resistant to the Tobacco Mosaic Virus (TMV), which causes mottling and yellowing in tomato leaves, reduced tomato size and yield, and brown fruit. "St" means the plant is resistant to Stemphylium or gray leaf spot, caused by the Stemphylium solani fungus. Affected plants develop brown to black spots, which progressively get bigger, turn gray, and drop out – leaving holes. "TSWV" means plants are resistant to the Tomato Spotted Wilt Virus. Symptoms vary from plant to plant, but can include yellow and brown rings on stems, brown streaks on p stems, dead leaf spots and tips, and severely stunted growth. Fruit may be discolored at maturity.